Has the ICRPG conversion been created yet? If so, is it contained in the Core Rules/Villain books? If not, where/when can we find them? Thanks! It's actually still in the process of being completed (a little past the halfway point). For the Kickstarter backers it will be added to the early access account as soon as it's complete. For everyone else it's on our calendar for an early June release, but may be released early depending on how long the proofing process takes for the physical book. Thanks! Super looking forward to it! Can we get bookmarks in the PDF? Is there going to be a GM screen for VC? I preordered the print books and Eric bloat was cool enough to hook me up with an early copy of the pdf. That being said, I’ve had a chance to read the rules more than a few times. This game is awesome. If you are in to the deep dark gritty comic books from back in the day, this is most definitely for you. If you’re a fan of the old Palladium Heroes Unlimited, but find that just a bit too crunchy, this game is for you. I have an “ode to the 80’s” comic book campaign I’ve been wanting to run for a while. I was going to use Heroes Unlimited until I got Vigilante City. Now I’m going to use VC along with some material found in Dark Places & Demogorgons. 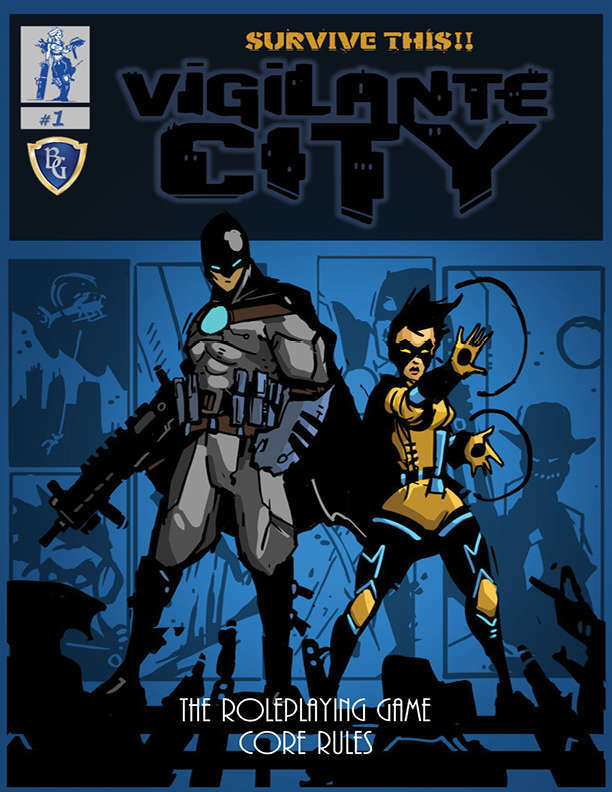 Vigilante City is an OSR game. The system is fast, fun and simple. Everyone can be up and playing a session with new characters in probably 30 minutes to an hour at most. It would serve well in both a campaign or a one shot. The art is top notch and really fits the feel of the genre. The rules read fast and are very easy...See more to understand. The cover is amazing too. It has a very “Dark Knight Returns” look to it. Now onto my gripes. These are just personal preferences that can easily be fixed with a house rule or two. I’m not crazy about the Mutant “Push” system or the limits putnon how many times you can use a power (such as number of times you can blast in a day). Again that’s just me personally, and it’s easily house ruled out. Many of you may like it as written though, and that’s cool too. In the future, I’m hoping to see class expansions, such as an “Alien” class and a “Back From The Dead” class to cover characters like The Crow or Spawn. I’d also like to see expansions on the existing classes, such as more mutant powers for the Mutant class and more animals and bugs for the Anthropomorph class. I’d also like to see an “Omega” overlay to use similar to the way Heroes Unlimited has the “Mega” overlay. It helps make more powerful villains and sometimes more powerful heroes when the players are mature enough to handle playing the role of such supermen. The last thing I’d like to see is levels 11-15, or even 20 for all of the classes. All in all, I love this system. Just a few house rules and I’m ready to use it. It really captures the look and feel of the gritty black and white comic books from back in the day that I really love, like the original Mirage Teenage Mutant Ninja Turtles. I highly recommend you grab this pdf, and then print on demand as soon as it’s available. I’m hoping I can afford to back it! Will there be a POD version at some point?